Not too long ago an inactive old rail corridor extended south from the MBTA Green Line D branch through Newton Upper Falls, overgrown and collecting debris. During the summer of 2014, work was begun to transform this corridor into the Upper Falls Greenway, a safe, car-free trail for walking, jogging, bicycling and general recreation, with easy access to the commercial areas on adjacent Needham Street for shopping and commuting. 2019 update: Kiosks and benches in place. Usage of the Greenway is great. First art display on the Greenway was in summer of 2018. Another one is planned for summer of 2019. Best place to find updates on happening or information can be found on our Facebook page, www.facebook.com/UpperFallsGreenway. The MBTA owns the land; they gave a long term property lease (99 years) to the city for a $1. The city enlisted Iron Horse Preservation Society, a nationally known rails-to-trails non-profit, to create the trail. Iron Horse removed the obsolete tracks and consolidated the railroad ties. Contractual difficulties resulted in Iron Horse not being able to compete the project. The City of Newton stepped in to complete the surface work at the end of 2015. Corporate donors provide additional funding for enhancements. See information on our donations for companies who have already enhanced the Upper Falls Greenway with their gifts. 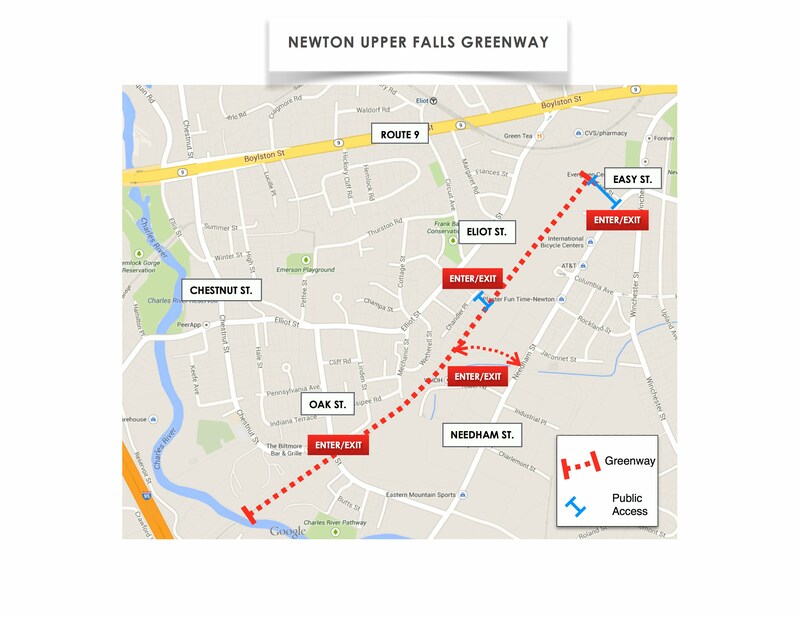 The Upper Falls Greenway Trail is a mile-plus linear park terminating at a scenic overlook of the Charles River. The trail map to the right gives additional detail. (Click on the map to enlarge.) The trail surface itself is rolled stone dust, a nice surface for walking and bicycling. Here's what the trail looked like in 2016. A future trail connection to Needham, Dover,and Medfield via the proposed Bay Colony Rail Trail may later provide the residents of Newton a chance to enjoy an off-road experience rivaling the popular Minuteman Bikeway in Lexington. Checkout our Facebook page, Friends of the Upper Falls Greenway, www.facebook.com/UpperFallsGreenway, for more information.